Brinicombe Equine Think Itch combines a blend of complex ingredients including trace element chelates, EFAs and anti-oxidants with Vitamin B3 to provide a formula which help to keep the skin comfortable and healthy, with less chance of irritation from midge bites. 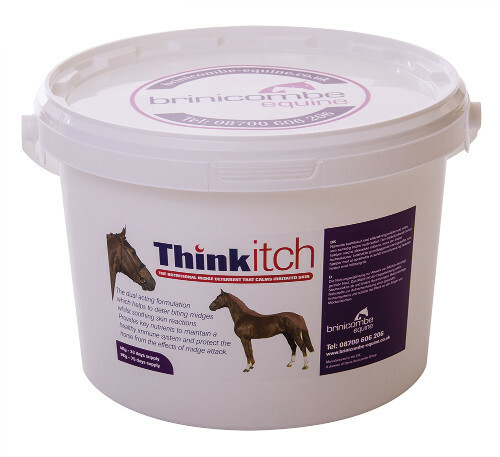 Think Itch has fly deterring properties and targets the immune response while supporting the skin condition of sensitive horses, who have conditions like sweet itch, to reduce discomfort and reduce the chance of the horse rubbing sore. Zinc and linseed oil are also important nutrients for the support of skin condition. Studies have show linseed oil as beneficial to horses with sensitive skin. Maize gluten feed, seaweed meal, methyl sulphonyl methane, garlic, linseed oil, flower of sulphur, cider apple vinegar, colostrum, BIO-MOS, magnesium sulphate heptahydrate. There is an initial loading dose with this product for the first 4 weeks of feeding. Below are some recent questions we've received regarding Brinicombe Equine Think Itch for Horses, including answers from our team. No I am afraid that it will not help very much at all. It is designed to reduce the feeling of itching and could therefore reduce symptoms, but it will not get rid of any mites. The best treatment is to clip the feathers very short, then apply something which is active against the mites and also helps to condition the skin. Selenium sulphide shampoo ("Seleen") is a good product to try. Ideally discuss this with your vet. It is best to wash the entire horse, not just the feathered areas, as a few mites will live elsewhere on the body and re-infest the treated parts otherwise. My highland scratches herself on any available immovable object and yet doesn't have sweet itch, scurfy skin, visible irritation, lice or mites. She isn't over rugged or stabled. She can go into the shelter (nedzbedz pro) as and when she wants. I fed ThinkItch throughout the warm autumn as there were flies and midges around and this did reduce the scratching. Has she become obsessed and has developed a habit or do you have any other thoughts? I was planning to re start with ThinkItch in the spring and was considering garlic too. Can you help any further? I think something will genuinely be making her feel itchy, I very much doubt that it would just be a daft habit. There can be many possible causes of itching, but by far the most common would be the sort of things you have mentioned. How sure can you be that none apply? A tiny number of mites can make a horse very itchy and some horses show very little sign of mites, other than being itchy. My feeling is that you are probably missing something and it would be best to treat her for mange if you cannot find anything else. (Dermapet lime sulphur wash is effective, used weekly for 4 weeks, though it is quite smelly!) Otherwise an examination from a good equine vet might be your best bet. Herbal treatments do seem to reduce the symptoms but they will not cure a genuine parasite problem.